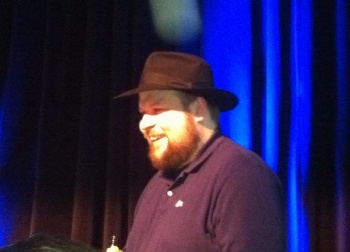 Markus "Notch" Persson discussed how the development of Minecraft was full of happy accidents. Minecraft was the big winner of GDC 2011, snagging many of the Independent Games Festival's top awards while game creator Markus "Notch" Persson endeared fans with his humble (and numerous) acceptance speeches. This year, the developer of Minecraft sat down with Maxis veteran Chris Hecker for a "Fireside Chat" on Wednesday at GDC. Behind a Minecraft-stylized TV-screen fire, Notch revealed his thoughts on developing Minecraft, indie titles, and the challenge of building female Minecraftian characters. He also mentioned that most of the crafting recipes he added to the game have been discovered and well-documented on wikis and websites, but there's one that still hasn't been found. Minecraft is an open-world game of crafting, building, and survival. Players have little instruction and little restrictions in terms of what they do in the game world, allowing players to explore their creativity. The world itself is populated by creatures, some hostile that need to be avoided, and some docile that can be used to your advantage. The AI behaviors of the monsters that inhabit the world has been one of the most compelling features of the game for the developer. In his discussions of local behavior, or behavior localized to the player, Notch cited an example of hostile creepers that initially would explode near your house when you weren't there and that wasn't what he wanted to have happen. So creeper explosions became localized. He admits that the most surprising activities he witnessed in the game dealt with "The monster AI stuff" like creepers. While errantly-exploding creepers didn't fit the game world, when some emergent behavior is interesting and makes sense, Notch keeps it in the game. As an example, Notch discussed when he entered the game and "wolves would chase sheep and I wasn't prepared for that... they would just run by you." The code was in there, Notch explained, but he didn't understand the behavior until he saw it. Happy with the results, "We definitely left it in there." He estimated, jokingly, that around "62.5 percent" of what's in the end is intended, there is always a give and take with how behaviors affect gameplay and vice versa. While a great part of what's in Minecraft was always designed to be included, a lot is from trial and error, and comes from entering the world that's been created and playing in it: "I play with it more than I write it," Notch admits. "I want to make sure it's fun." Notch was asked about creating a female character in Minecraft and he was quick to point out that all of the game characters are gender neutral-- all of the animals in the game take traits from both genders. However, Notch admits that in the beginning he always thought of the player-character as male. "We attribute blocks to maculinity," he concedes. "Guys are more square" traditionally and so if Minecraft were to include a female character "We'd have to make a more round model," he stated to the amusement of Chris Hecker. In the years he's now been working on the game, Notch discussed some mistakes he made. While staircases and lanterns made sense aesthetically in the game world, Notch concedes that the half-meter blocks were a mistake as essentially "You've doubled the number of blocks" and created a major headache for coding. But, he can't put the genie back in the lamp. The developers of Minecraft "can nerf existing behavior but can't remove blocks people have used to build...if it breaks cool structures, we can't change it." Notch is famed for his loyalty to his players and his receptiveness to their criticism and will even go so far as to not break save games that players have spent hours creating. Asked if he would do anything differently given the benefit of hindsight, Notch freely admits that he "would have started multiplayer much earlier ... and I did it twice!" Right now, he doesn't have any multiplayer vs single player statistics, and so has little way to understand how multiplayer is doing. He fully admits that "multiplayer programming is boring" and has never made it a high priority. Surprisingly, a lot of his multiplayer feedback comes back simply from tweets. Crafting is the fabric that ties the game together-- it lets you build everything from tools to the building blocks for massive houses. While some are quite simple, other recipes to build certain substances and objects can be complex and are much sought-after among Minecraft fans. Initially, "It started as intuitive enough so you could brute force it," Notch explained. "But then we realized that crafting is what gets people to talk to other people about the game." Notch admits that he "Didn't provide links in the game ... which would have been a good thing to do," but actually likes how players have to go online and talk to each other to learn more about crafting. When he saw the community that cropped up around his game, Notch "just encouraged it and said 'Hey, I love this.'" There are many, many recipes in the game that require days to find the ingredients to and utilize. But, "there is one thing people haven't found yet." Notch, of course, remained silent on what that one recipe is.